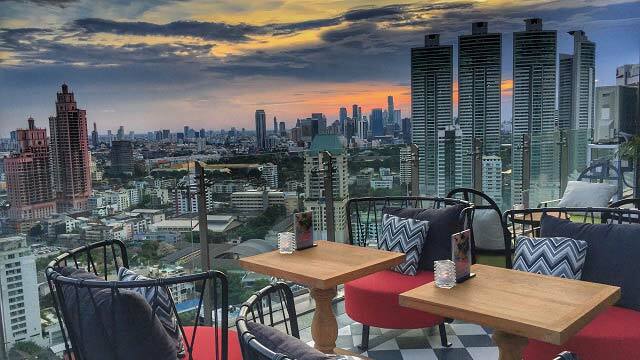 A complete guide to the 37 best rooftop bars in Bangkok in 2019. The best way to get away from the ever buzzing streets is to look up and find relaxation at one of the best Bangkok rooftop bars. 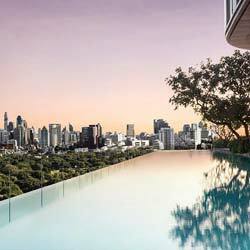 For starters: Which are the best rooftops in Bangkok? 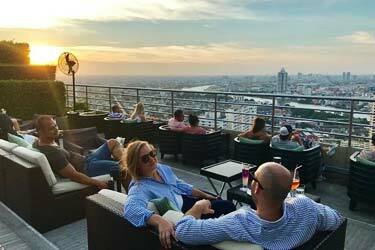 To help you get the answer of that question, we have put together the ultimate guide to the best rooftop bars in Bangkok. Here you'll find all the info you need about each rooftop. Opening hours, dress code, pictures, maps and much more. 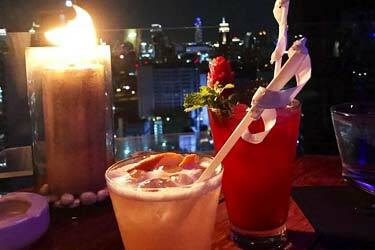 Just scroll down and find the Bangkok rooftop bar best suited for you. Or use the Bangkok rooftop map in the bottom right corner. 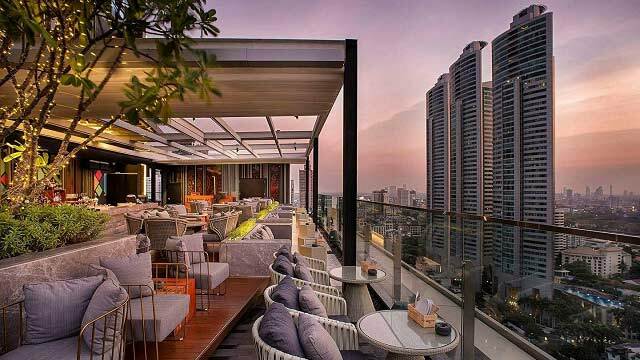 Bangkok’s first rooftop Vodka bar, located on top of the new Novotel Bangkok Sukhumvit 4, in the heart of a bustling business and entertainment district. 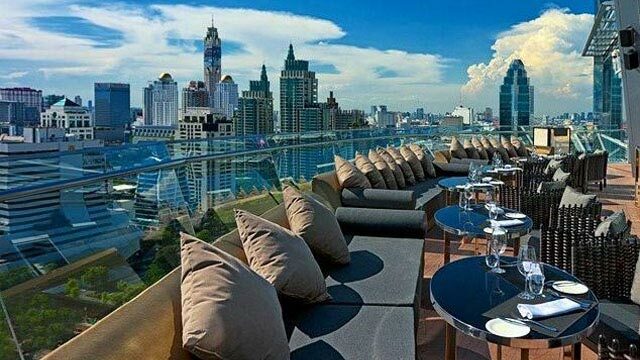 With an airy and spacious terrace, luxurious and innovative in decor, RedSquare rooftop offers the finest Vodkas from around the world, signature cocktails and creative light bites along with a stunning panoramic view of the glittering Bangkok skyline. Come for magical sunsets of lower Sukhumvit and enjoy daily happy hour between 6-7pm. A fantastic cocktail bar perched on top of the Rembrandt Hotel Suites and Towers in central Bangkok, and while the hotel has been around for a long time, the rooftop bar is quite a new addition to the Bangkok rooftop scene. 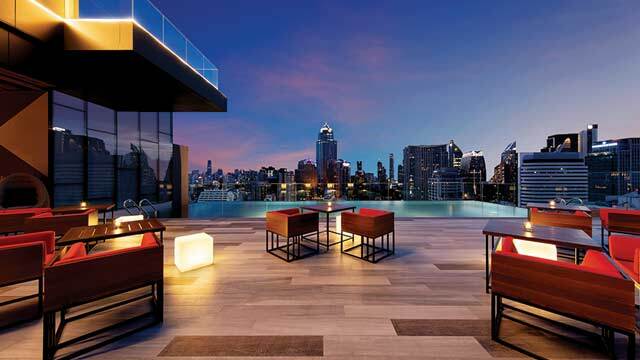 Modern, sophisticated and stylish in decor, the al fresco terrace comes with a lovely view over the Bangkok skyline. Here you can enjoy creative mixology with storytelling cocktails made from fresh ingredients, all in a calm, friendly and relaxing atmosphere. The full name is Scarlett Rooftop Wine Bar & Restaurant, and this is a very stylish and intimate, yet vibrant and cool rooftop bar and restaurant. Perched on the 37th floor of Pullman Bangkok Hotel G, in the middle of Silom Rd, this is the place for both great dinners, cool drinks and amazing views. The spacious indoor lounge leads out to an open-air and lush terrace, offering fantastic views over the skyline and Chaopraya River. Indulge in tasty French cuisine, a very impressive wine list and a fantastic atmosphere. A superb roof terrace in Bangkok with a fantastic restaurant, located on the 33rd floor of the building Fraser Suites Sukhumvit. Serving Peruvian / Japanese cuisine along with some fantastic Peruvian-inspired cocktails. Live entertainment every night, from DJs and sometimes jazz bands. Awesome design at the rooftop bar, resembling a city park with structural trees, a maze and even a bathroom with a fantastic view of the Bangkok skyline. 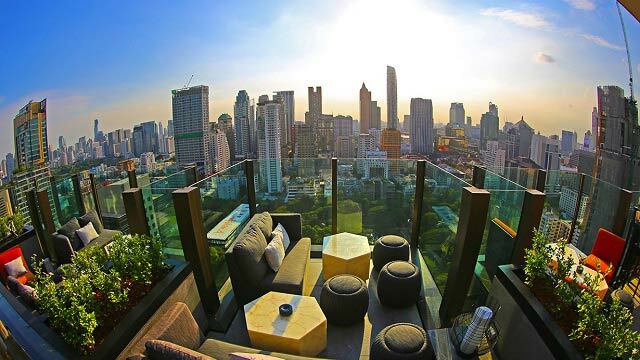 From this terrace you get Bangkok's best 360-degree view. 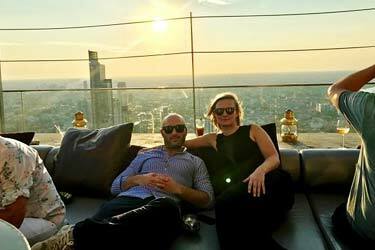 One of the highest and best spots in Bangkok for cocktails and partying with a view. Resident DJs create a nice lounge vibe every night over the rooftop that covers 3 entire floors. The rooftop bar menu serves Asian bar bites, seafood, some grill dishes, along with signature cocktails like a refreshing Thai Mojito. 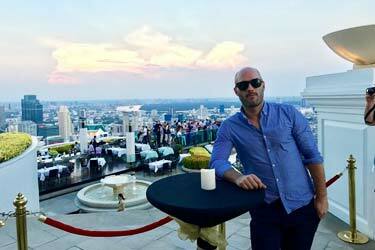 A quite newly opened rooftop bar in Bangkok, with both fantastic views, tasty cocktails and a superb party atmosphere. 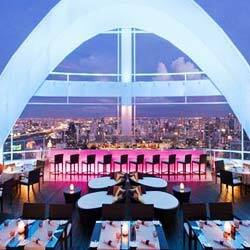 The Vanilla Sky rooftop bar is one of the first nightclubs located on a rooftop in Bangkok. 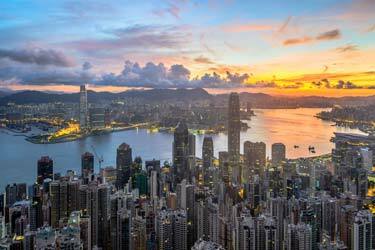 From the 36th floor you can expect an amazing 360-degree view over the city along with Live DJs, mixed crowds and tasty bar snacks. 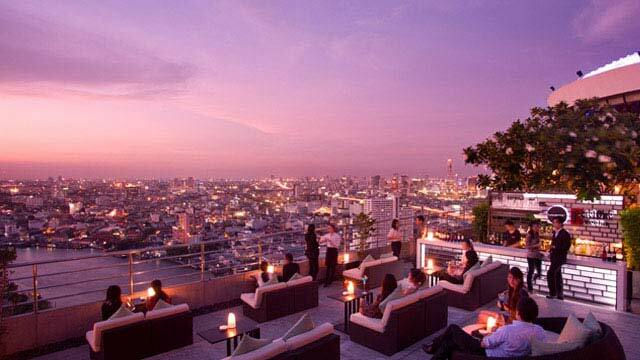 One of the most famous Bangkok rooftop bars, and even in the world. From the roof bar and kitchen you can order authentic Mediterranean cuisine along with a wide selection of wines, all at an unbeatable 360-degree view all over Bangkok. A 'bucket list' destination with high popularity and quite hefty prices, reservations in advance are highly recommended. 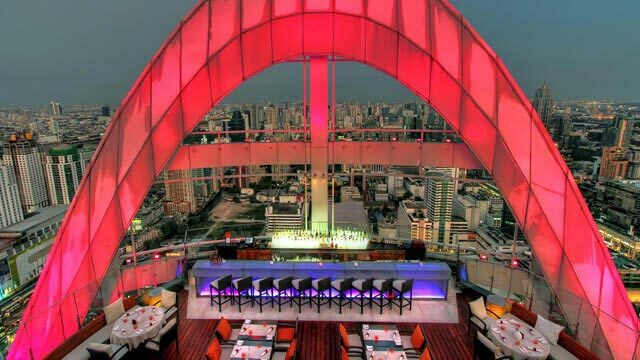 This Bangkok rooftop bar is located on the 61st floor with an outstanding 360-degree view and a double setting, where the luxurious rooftop restaurant is called Vertigo and the bar is called Moon Bar. Drinks range from expensive champagnes, exotic cocktails to beer and non-alcoholic and food from seafood to premium steaks. All of absolute top class. 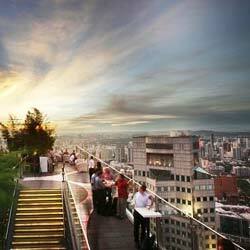 Best time to visit the rooftop is for a Vertigo Sunset. 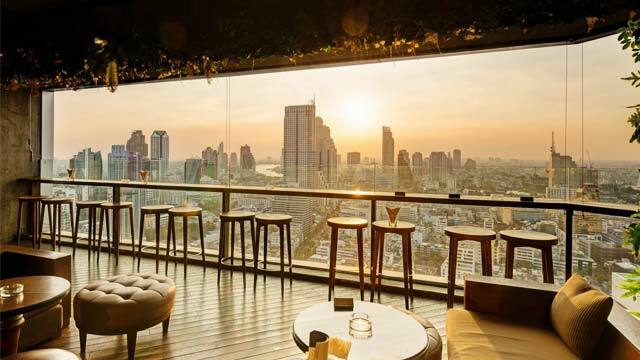 Up on the 29th floor of the SO Sofitel Bangkok you find both the Park Society rooftop restaurant and the HI-SO rooftop bar, both offering great views over the skyline and the beautiful Lumpini Park. The restaurant offers "Modern Western Cuisine" of the highest class and in the bar you can order creative signature cocktails along with a wide range of bar bites. The atmosphere is cocktail lounge feel early evenings, and a nice party atmosphere during the weekends and late nights. 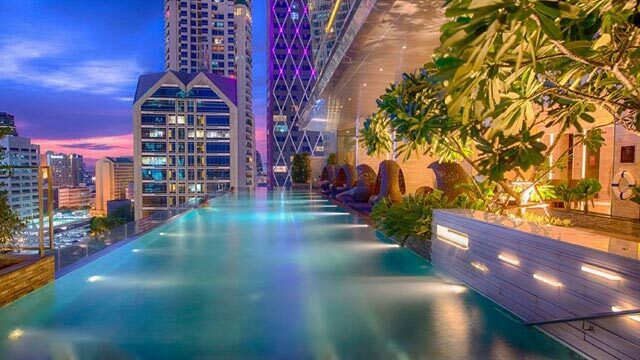 Check out the 5 best rooftop pools in Bangkok. Some fantastic infinity pools with breathtaking views. Don't miss out when visiting Bangkok! Sky Bar is located on a precipice, 250 meters up, sharing floor and space with the rooftop restaurant Sirocco and offering the same breathtaking views. Well known from the movie "The Hangover II", this is a popular tourist spot and the roftop bar is always crowded. But almost a must to check off the "to do" list. So get here early, make sure the wallet is filled and enjoy a signature cocktail in the luxurious environment. 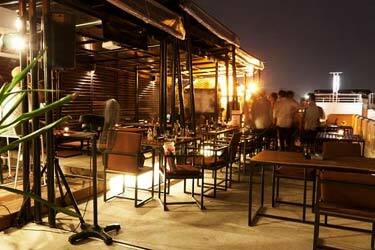 CRU Champagne bar is one of the newest and most hyped rooftop bars in Bangkok and Asia. 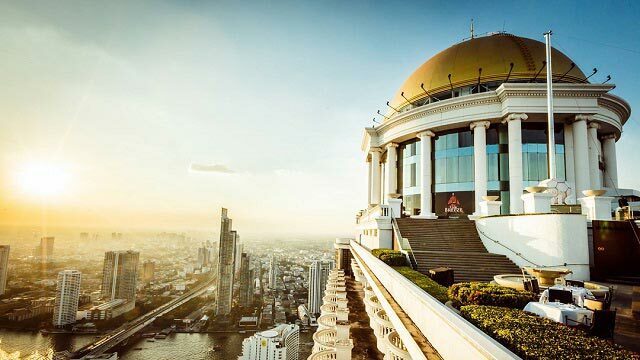 The al fresco champagne bar is perched on the roof of Centara Grand, offering a magical 360-degree view over all of Bangkok. Enjoy their own Champagne brand called 'Pink Mumm No.1', or something from the snack menu ranging from spicy snacks to foie gras and oysters. All with a 'wow-feeling' and promises of a memory for life. 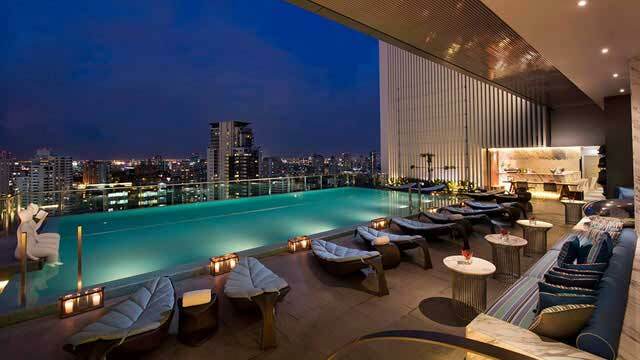 If you like a good rooftop pool, this is the perfect roof terrace in Bangkok to visit. Perched on top of the nice Hotel Mercure Bangkok Siam, offering great views, tasty cocktails and a relaxing atmosphere. 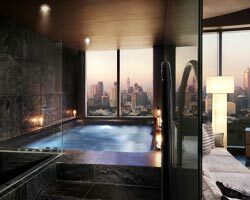 Only for hotel guests, so book your stay here to swim high above the city sky scrapers. 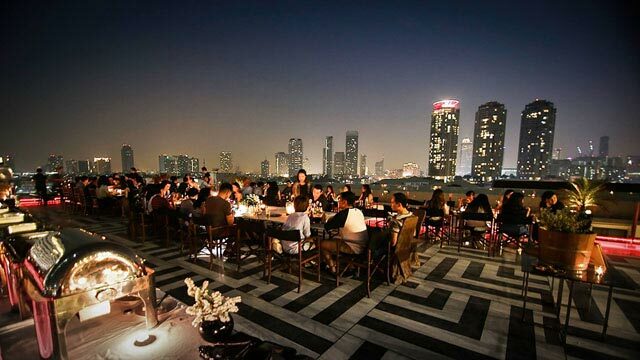 Dine and drink at the best rooftop restaurants in Bangkok. Breathtaking views and a feast for both eyes and taste buds! 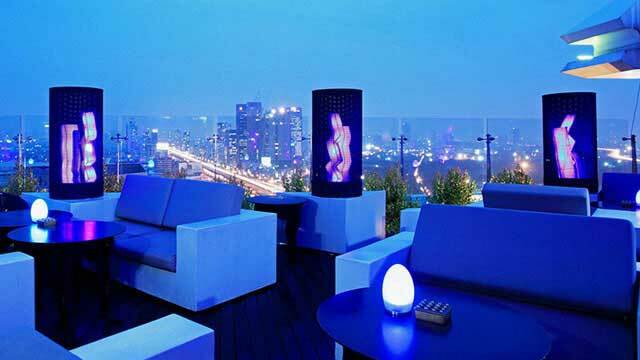 Located at the 26th floor of the luxurious hotel Novotel Bangkok Sukhumvit you find the Sky on 20 rooftop bar. The amazing skyline views from the sky lounge is accompanied with a wide variety of fantastic cocktails, like prosecco based 'Bubble drinks', along with live entertainment every night of the week. Sunset and happy hour between 5-7pm is a perfect time to visit the terrace, which feels like a small roof garden with a really nice atmosphere. Probably one of the best of all the Bangkok rooftop bars, especially to visit for a magical sunset. Still, not that many tourists have found their way here...yet. 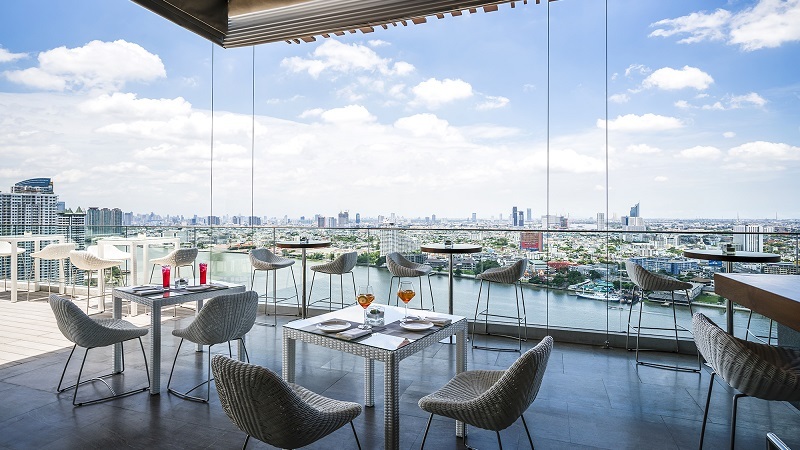 As the name indicates, the rooftop offers a magical 360-degree view of the Bangkok skyline and Chao Phraya river. Add signature cocktails in generous size, a food menu including classic asian bar bites and ThreeSixty Jazz Lounge and you understand this place is well worth a visit. From the roof bar you get a magical 360-degree view of Bangkok and there are plenty of "front-row" seatings. The setting at Cielo Skybar is a bit like 1960's elegance, with a relaxed atmosphere and a good and quick service. You can order from a good selection of wine and beer, signature modern technique cocktails and alot of classic ones. The full name is Cielo Skybar & Restaurant, so there is a full kitchen serving well made Thai and Western food at very reasonable prices. 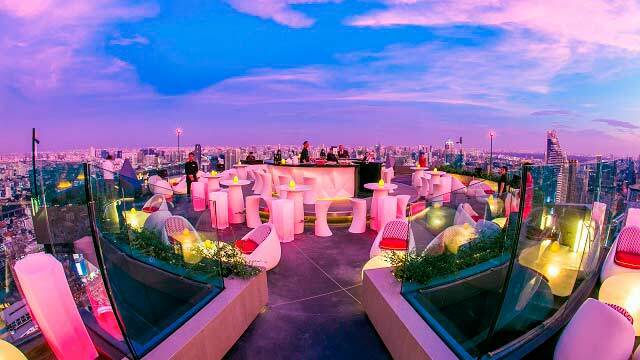 This rooftop venue has a colorful and fashionable interior with a fantastic view of Bangkok. Located at Mode Sathorn Hotel, which has been touted as "the First Party hotel of Bangkok", so you can imagine that the party atmosphere at The Roof @38 Bar is fantastic. The bar offers a good cocktail list, good wines along with a food menu consisting of a wide variety of Moroccan, French, Asian and Mexican specialities. 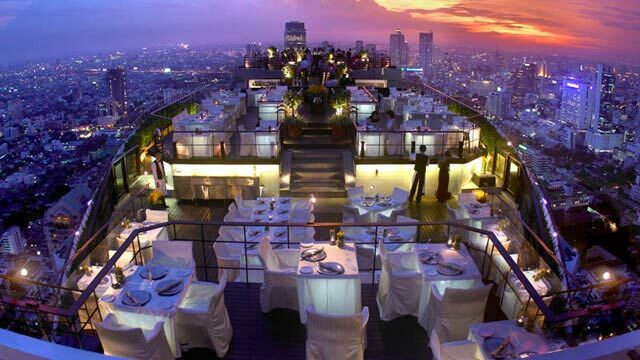 This place has one of the best rooftop restaurants in Bangkok. Superb cuisine made to perfection, including American Wagyu Beef and a Surf & Turf that should not be missed. Red Sky is situated over two levels, one with a restaurant and one with a bar. So appart from dinner, the location right next to many of the biggest Bangkok shopping centers also makes it a perfect spot for a shopping break drink, enjoying the amazing 360-view. 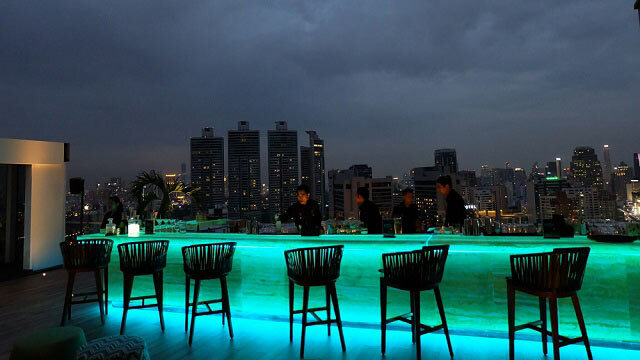 A good rooftop bar in Bangkok which many regard as a perfect drink place that is not to crowded. Decorated in minimalistic Zen-style and wit a perfect location among many of the famous shopping centers available in Bangkok. The rooftop offers both indoor and outdoor seating, fine views of the Bangkok skyline and signature cocktails along with food from five different kitchens. Choose between Thai, Italian, Japanese or Indian. 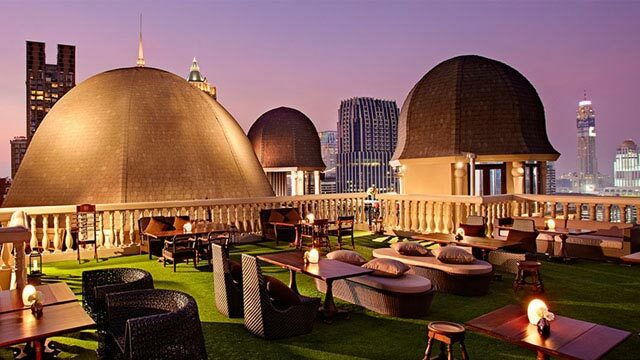 This Bangkok roof terrace is located at the luxurious hotel Sivatel Bangkok. 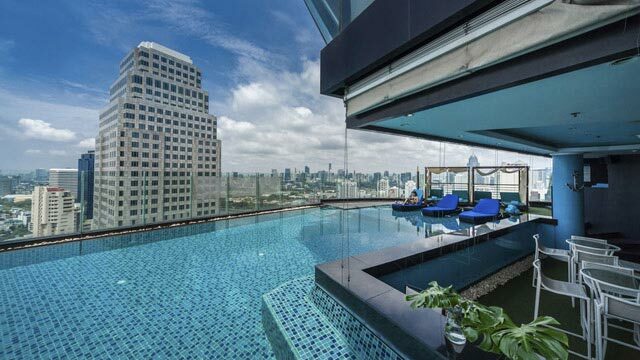 Up here you find a luxurious and big rooftop infinity pool and an absolutely magical view of the Bangkok skyline. However, to enjoy a signature cocktail in one of the in-water sun beds, you have to be a guest at the hotel. Perfect if you are looking for a peaceful and quiet rooftop experience. 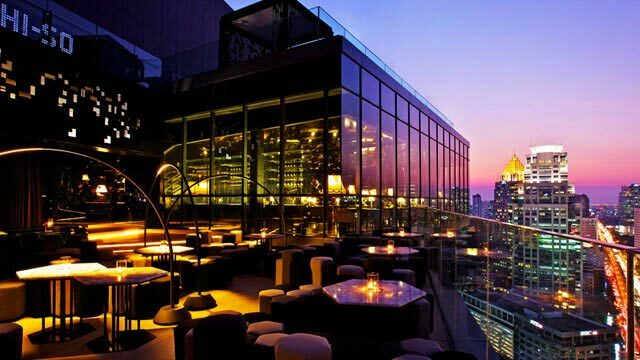 A luxurious rooftop bar in Bangkok, located at the beautiful Eastin Grand Hotel Sathorn. The roof terrace is equipped with a giant rooftop pool for hotel guests, and for everyone else a poolside hang-out bar and a restaurant called Blunos, where 2-Michelin Star chef Martin Bluno serves a wide range of international dishes. Expect a relaxed atmosphere and a resident DJ nightly from Tuesday to Sunday. A Bangkok pool bar (called Lapse), located at Hilton Sukhumvit's rooftop terrace. 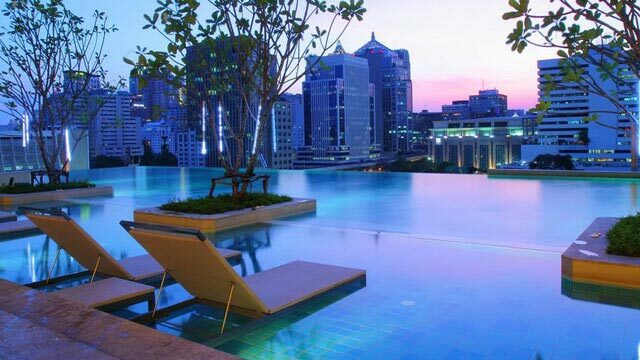 For those who like luxurious rooftop swimming pools, this is one of the best Bangkok has to offer. The magnificent view of the skyline that you get from the infinity pool is absolutely unbeatable. The decor on the terrace is modern and luxurious, and the bar serves classic poolside drinks and dishes. 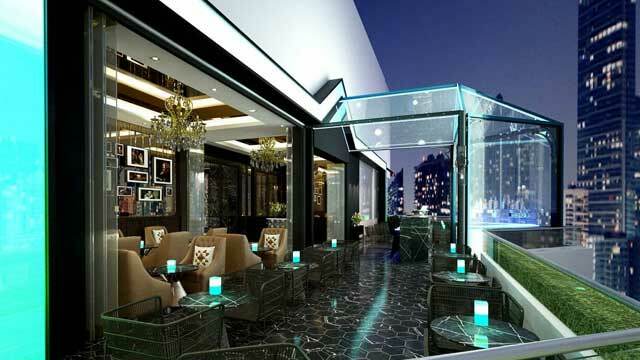 The AkaAza rooftop bar is a hidden gem located on the 26th floor of the Amara Hotel Bangkok, a luxury hotel in the heart of Bangkok. On the terrace you find both a truly luxurious infinity rooftop pool and a really great rooftop bar / pool bar, open for everyone and with service of the highest class. 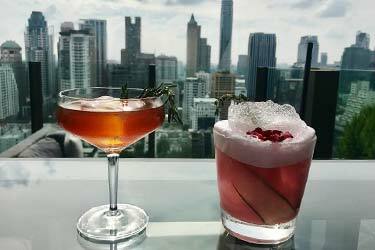 A wide range of well-priced cocktails and a smaller food menu is accompanied with views of the Bangkok skyline and all the sky scrapers. A cocktail bar and rooftop pool in Bangkok (called H2O), located at the 37th floor of the Continent Hotel Bangkok and with an absolutely stunning view of the Bangkok skyline and surroundings. Breezy poolside vibes during the day, and at night the space works a bit as the terrace for the Axis & Spin Sky Lounge, situated indoors one floor up. There are also two more rooftop restaurants at the hotel, albeit indoors, but still a real rooftop complex. 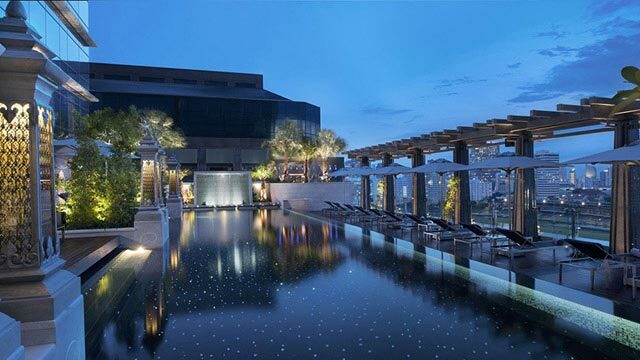 A rooftop pool and bar located at the luxurious and modern hotel St Regis, with stunning views of the Bangkok skyline and the Royal Bangkok Sports Club. The best thing about this place is the cool rooftop infinity pool, surrounded by a garden-like setting. From the rooftop bar you can enjoy classic cocktails along with the signature taste sensation Siam Mary, including Thai chili, wasabi and coriander. To go with the drinks there is also classic bar bites available. Mojjo Lounge Bar is a sky bar in Bangkok, located in the Sukhumvit area, with sparkling views, vibrant atmosphere, cool music and Latin style. The aim of the rooftop is to create a feel of Havana back in the days. Creative menus regarding food and drinks, a cigar bar, nice lounge sofas and live music on Saturdays are some of the highlights at this rooftop. 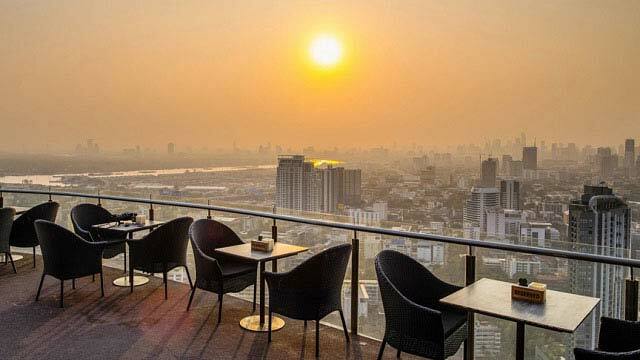 Zoom Skybar and Restaurant is located on the 40th floor at Anantara Sathorn, and from the rooftop bar you get a stunning panoramic view of the Bangkok skyline in all directions. Sit in the long bar, some of the lounge sofas or at the regular tables, the vistas are great from everywhere. 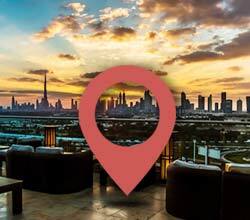 Visit for sunset views and a cocktail or two from the quite impressive drink list (including six different Gin & Tonics) or enjoy both Asian & International dishes if you are looking for a full rooftop dinner. Classic cocktail bar, located on the 64th floor of the famous Lebue State Tower. Quite small rooftop, but the seating available is really cool. Edge sofas all around the terrace, getting you really close up with the impressive skyline. Distil is a bit less known compared to Sirocco and Sky Bar one floor down, which means there is a better chance to get a good spot here. Try to arrive at opening around 5pm to catch the best seat, the amazing sunset and a creative cocktail. Long Table Bangkok rooftop has two main prides. Being Bangkok's preeminent Thai restaurant and having Thailand’s longest existing restaurant dining table (25 meters long). A third pride should be the view over the Bangkok skyline, which is really good from the 25th floor of the Column Bangkok Hotel. Friendly ambience and a perfect place for a rooftop dinner with a genuine Thai-feel, or just some cocktails from the extensive drink list. 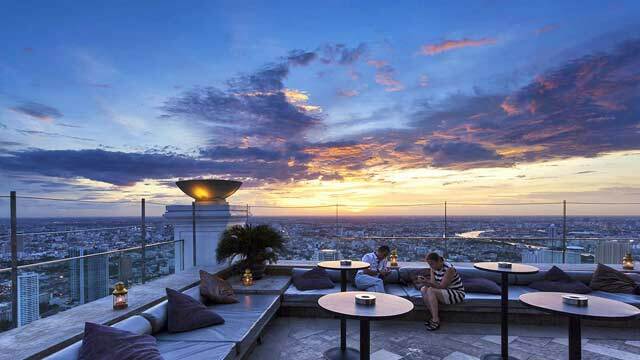 This rooftop bar is located in the north of Bangkok, so it offers both a stunning and a bit different view from other Bangkok rooftops. The terrace has a very modern and futuristic décor and both a restaurant and a bar. The restaurant serves European food and the bar offers a good set of cocktails and a really impressive wine list. Usually surrounded with a relaxed and friendly lounge atmosphere. 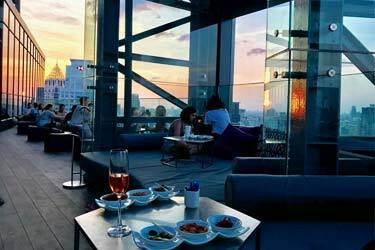 A fairly new rooftop bar in Bangkok located on the luxurious Hotel Indigo. In addition to the stunning cocktail bar, there is also a very nice restaurant and a luxurious and modern infinity rooftop swimming pool. 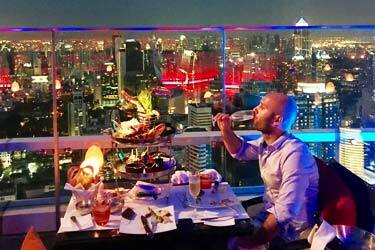 At the bar you get mighty views of Bangkok's skyline, mixologist cocktails matching the views along with bar bites and cigars. One floor down is the CHAR Restaurant, serving great contemporary grill, both meat and seafood. 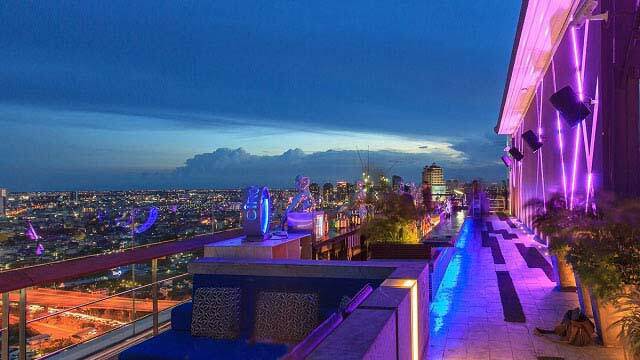 Novotel boasts two fantastic roof terraces in Bangkok. On one terrace you’ll find the sofisticated bar called Bar9 Beer Garden. As the name might give away, the decor on this terrace is garden-like and cosy and they serve refreshing signature cocktails and a range of bar snacks, pizza, burgers and Asian dishes. For more private relaxation, there is an additional roof terrace where only hotel guests are welcome, where you find a magical infinity rooftop pool. If you like luxury, relaxation and stunning views, this is a great place in Bangkok to come to. 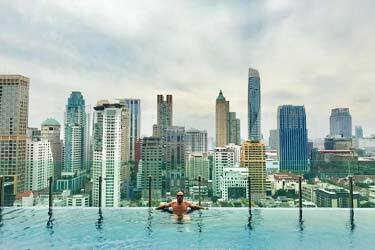 In order to use one of the coolest rooftop pools in Bangkok, you have to be a guest at the hotel. Otherwise you visit the fairly new Attitude rooftop bar which is also located here. A really stylish end elegant rooftop bar with a great atmosphere, nice service, asian tapas, creative and tasteful mixologists cocktails and live DJs. 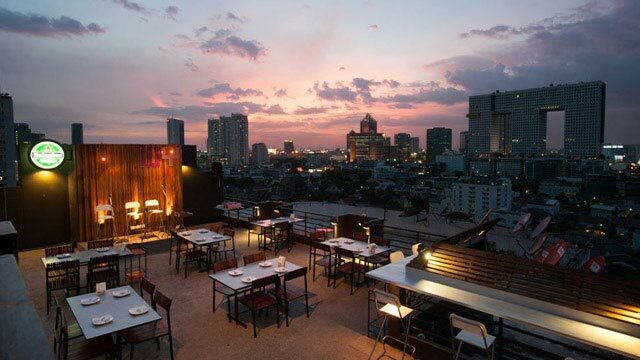 A rooftop bar in Bangkok (called Top Knot) with a luxurious and spacious terrace with room for both numerous food and beverage guests. Despite being "only" on the 10th floor you still get a great view over the city skyline and the Chao Praya River. From the rooftop bar you can order a selection of signature cocktails, along with both classic and frozen ones, and the kitchen serve a mix of International and Thai dishes. And all of this at very reasonable prices. At the terrace of The Water Club there’s almost always a fun and nice party feeling, regardless the hour of the day. 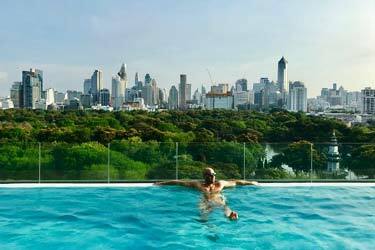 Here you’ll find a large and fantastic rooftop pool to cool off in, nice furniture’s to hang out in and the Solarium Oasis Lawn, a perfect place for a sunset picnic with views over Lumpini Park and the Bangkok skyline. The last Saturday of every month the party atmosphere reaches new heights with the SO Pool Party, promising 8 hours of wet fun. An award-winning cocktail bar in Bangkok located on the 24th and 25th floor of the Hotel Muse Bangkok. 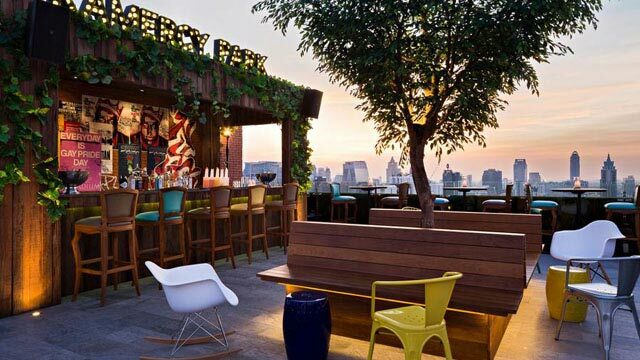 The rooftop is inspired by the elusive hideaway bars of 1920s prohibition-era America, and there is a relaxed and sophisticated atmosphere on the terrace with fantastic views of the Bangkok skyline. There is a restaurant with a Michelin cook that serves Asian small dishes with an international touch and an impressive set of mixologist cocktails. You can even create your own Gin Tonic. Situated in the north part of Bangkok in the Lad Phrao area, on top of Pisawit Tower. 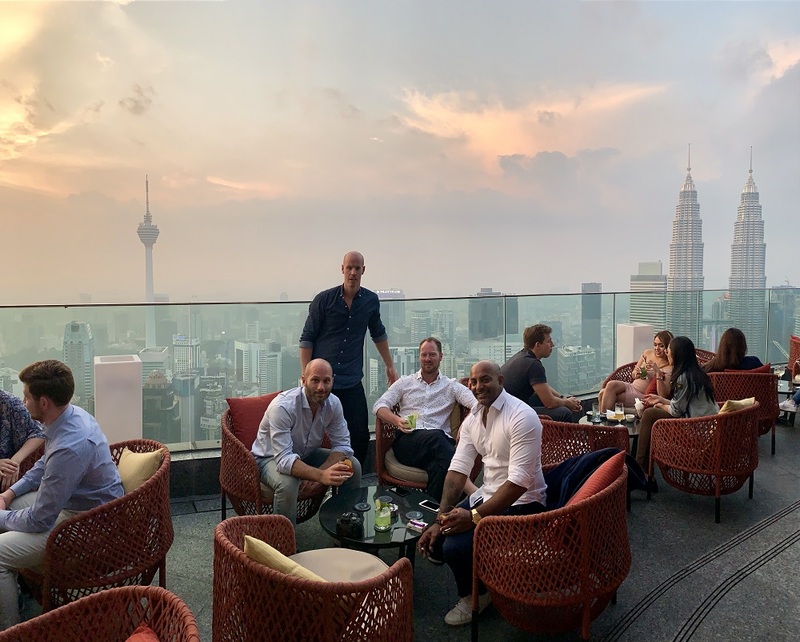 It is not the fanciest or most spectacular rooftop in the city, but with very good prices and an amazing 360 view of the skyline, it is definitely worth a visit. The rooftop bar offers all the drinks you would like and there is a food menu with some really good Thai dishes. Sometimes there are live bands or DJs playing tunes, and the atmosphere and service is very friendly. 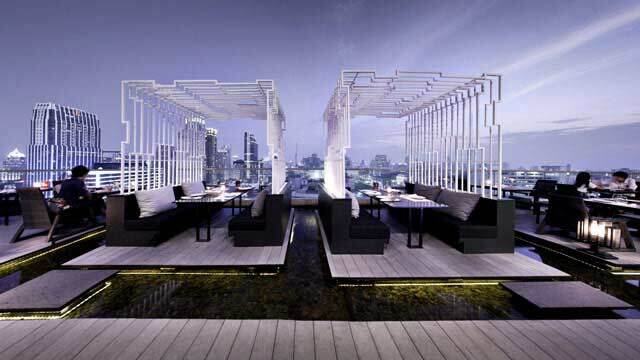 Okura Prestige has a luxurious roof venue in Bangkok with an outstanding restaurant called Up & Above. The kitchen offers wonderful food during breakfast, lunch, dinner and also on Sundays one of Bangkok's best brunches. The large indoor bar & restaurant is open all day (from 06 in the morning), while the outdoor half-moon shaped terrace opens at 18. Although the main focus is the food, the view and the atmosphere is world class here to. 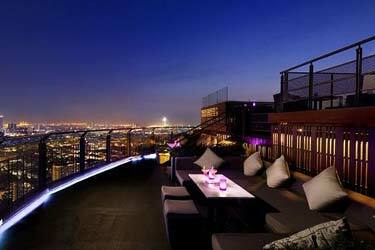 Bangkok is considered as one of the world's top cities in terms of rooftop bars and roof terraces. The amount of towering skyscrapers allows one to find Bangkok roof terraces with magnificent views almost everywhere. 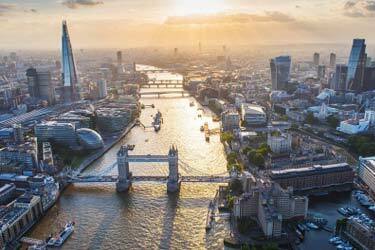 This, combined with good food and cheap prices make the city one of the most popular destinations in the world. Bangkok is absolutely teeming with good and mighty rooftops. 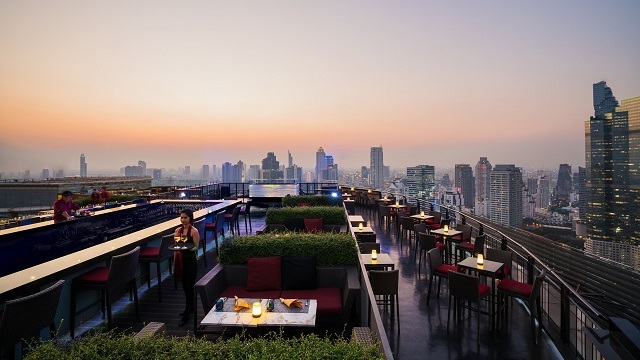 We have gathered all the best roof bars from Bangkok in one place. Considering all the new top terraces in Bangkok that opens up, the page is filled with new ones continuous throughout. 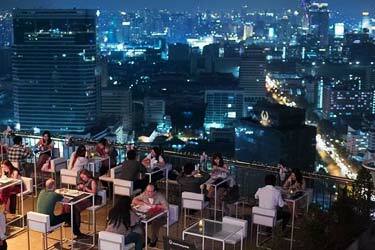 So look out for the best rooftop bars in Bangkok here. The roof restaurants and bars are very scattered geographically and considering that Bangkok is a rather unfriendly town in terms of walking, the best option is to go by taxi between the various sites. There is no quite exact city center which contributes to the diffusion of roof terraces here. Typical criterias for the being the best rooftop bar in Bangkok, is a location at a high altitude with amazing skyline views. So what are you waiting for, get out there and find the best bars and restaurants with a view, that suits your criterias and location. 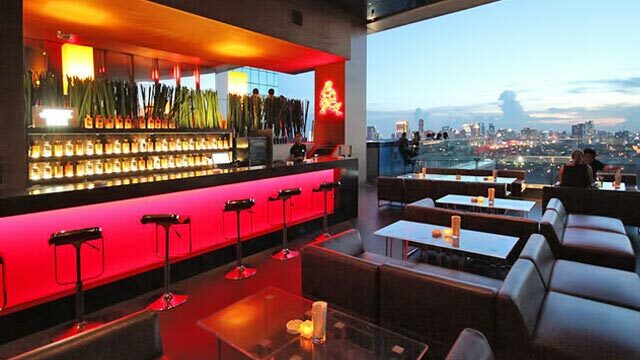 You can also find the best sky bars in Bangkok at our map here on this page. 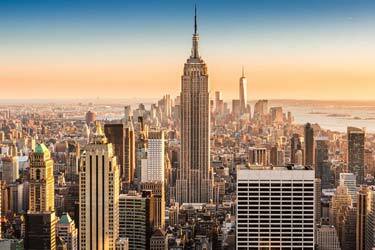 For more indept info about this amazing city, read here. Bangkok is Thailand's capital and also the largest city with about 15 million inhabitants if you include the entire metropolitan area. The city consists of both modern skyscrapers, palaces, temples and shantytowns. If you like Asian and particularly Thai food, you have certainly come to the right place if you go to Bangkok. 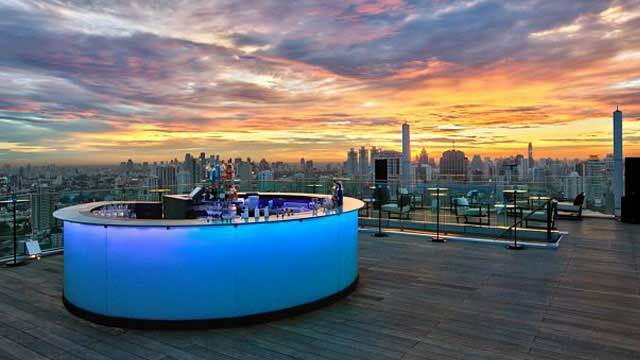 So, which is the best rooftop bar in Bangkok? 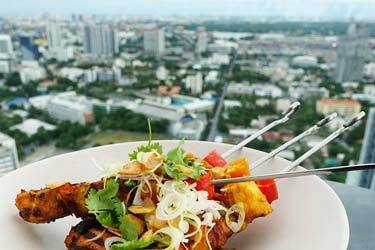 On the rooftop bars in Bangkok you can eat great Thai food at a very good price. In Bangkok, most things are very cheap. It also applies to food and drinks on the roof terraces here. Obviously, prices are slightly more expensive on these places, but still very good compared to many other countries. Regarding beverages most things are available here. Cocktails, wine, sake, beer, etc. What's better than an ice cold beer to the view of Bangkok's skyline. 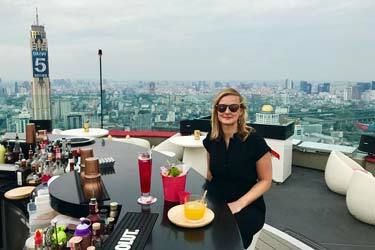 Rooftop bars in Bangkok are not often used as party venues, but more like a place you go to in the afternoon and evening to enjoy drinks and some good food. 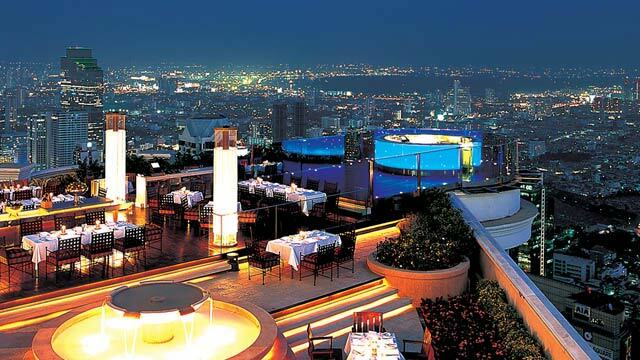 Bangkok is probably the city in the world that has the most rooftop bars with magnificent views. 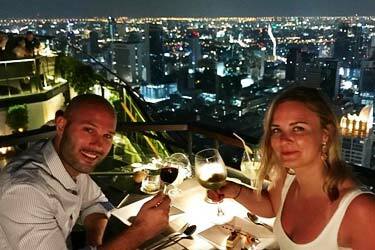 The rooftop bars in Bangkok are often located at very high altitudes in a skyscraper with absolutely stunning views of the Bangkok skyline and its surroundings. Bangkok is a very spread out city which gives various views from the different roof terraces. Often with 360-degree views and at an altitude of a few hundred meters. Sunset views of the city and Bangkok in the dark are two of the coolest urban views you can find. Regarding shopping, Bangkok is one of the world's best cities for this. The range of shops along with the incredible prices makes many come here a few extra days just to shop. The temples in Bangkok is one thing you cannot miss when you are here. The temple Phra Kaew and the Grand Palace is the most popular and finest the city has to offer. Otherwise, many tourists come here to look at Thai boxing, or visit one of the city zoo. 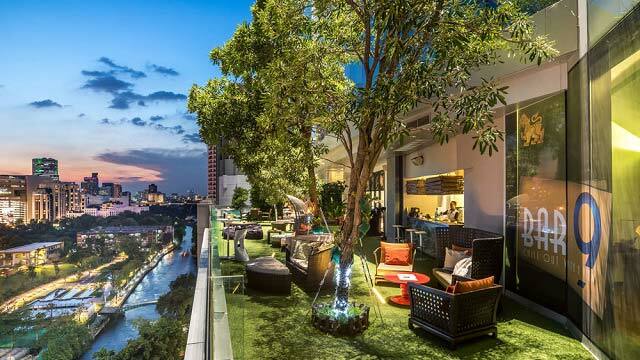 For those who want to relax the city's rooftop bars or the Lumpini Park is the best option. And here you can find a great guide to things to do in Bangkok. 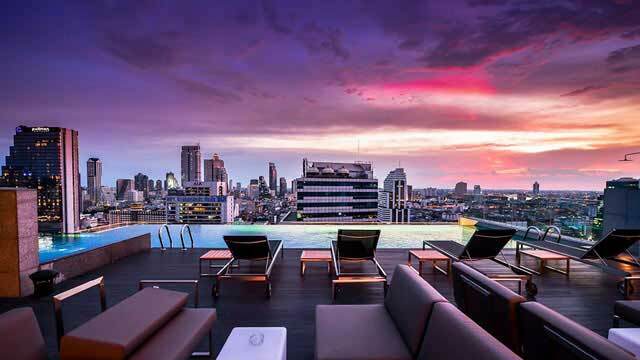 Bangkok is ranked as one of the world's best cities when it comes to rooftop bars, and the same goes with rooftop swimming pools at the terraces in Bangkok. Lots of hotels have rooftop pools. 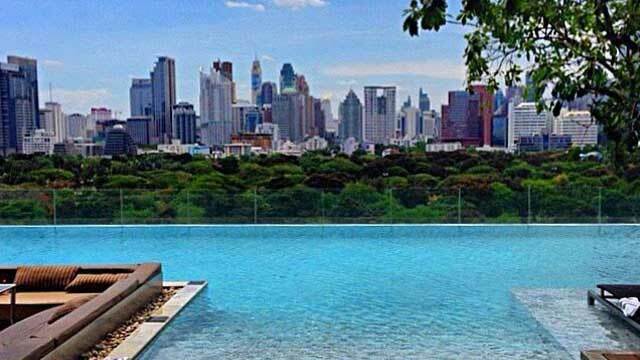 Those rooftop pools you can find are very large and luxurious with good views of Bangkok's skyline. If you like pool parties, they organized it at regular intervals on the roof terraces equipped with rooftop pools. 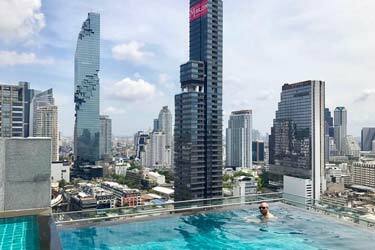 Do not forget to book your hotel in Bangkok with a rooftop pool with us, to be able to take part of this luxury with a rooftop pool and get the best prices on hotel rooms. Bangkok is a real hub in terms of flights from all over the world. Which means that many flights from all over the world is right here. The airport is fairly close to the center which makes it easy to get from and to the airport by taxi, bus or train. There are also lots of good hotels. 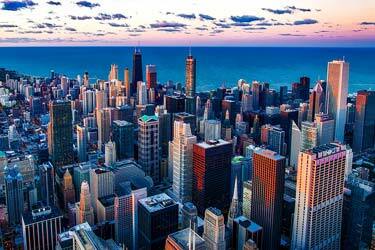 Given that the city is very large and spread out there are some fantastic hotels in almost all the districts. Many of the finer hotels are often equipped with beautiful rooftop bars and in many cases with cool rooftop swimming pools. Book your hotel directly at our site to get some of the best prices and offers. And here you can find one of the best Bangkok travel guides out there.